I made these when my friend, Michele, was in town from the UK, and luckily, she grabbed a quick iphone photo! These pancakes are really good. Like really good. The perfect combo of cinnamon rolls & pancakes- brilliant RecipeGirl! Unfortunately, although I have made these twice, I have not taken any pictures of the final result! I guess I was really hungry & impatient. Regardless, I wanted to share the recipe with you so you can enjoy them too. The cinnamon filling & frosting last for a while in the fridge, so all you need to do is whip up another batch of pancake batter (Feel free to use your favorite recipe instead) & heat up the cinnamon sugar mixture in the microwave to make it softer- add some melted butter if needed. For the final result, you don't NEED to add syrup. Or chocolate chips. I think the syrup adds a little extra something. And hey, you need the glaze too! Whisk together dry ingredients in a medium bowl. Measure the milk in a large measuring cup, add egg & oil and beat slightly with a fork. Whisk in wet ingredients until batter is just moistened. (lumps are A-OK). Mix together all 3 ingredients until well combined and scoop into a plastic bag. Set aside to set up. You don't want it to be too runny or too hot- the consistency of toothpaste is just right. You can put it in the fridge for a few minutes, if needed. In a small heatproof bowl, heat butter in microwave until almost melted. Add cream cheese until melted. Be careful, the cream cheese will "pop" in the microwave. Whisk in remaining ingredients until smooth. Set aside. Heat a large skillet over medium-high heat and spray with butter cooking spray. Scoop 3/4 cup batter into pan. Wait 1 minute and snip small amount of corner of bag and squeeze spiral of filling on top of pancake. Once lots of bubbles begin to form on the top, flip pancake and cook a few more minutes until both sides are cooked through. Top with cream cheese glaze and maple syrup, if desired. 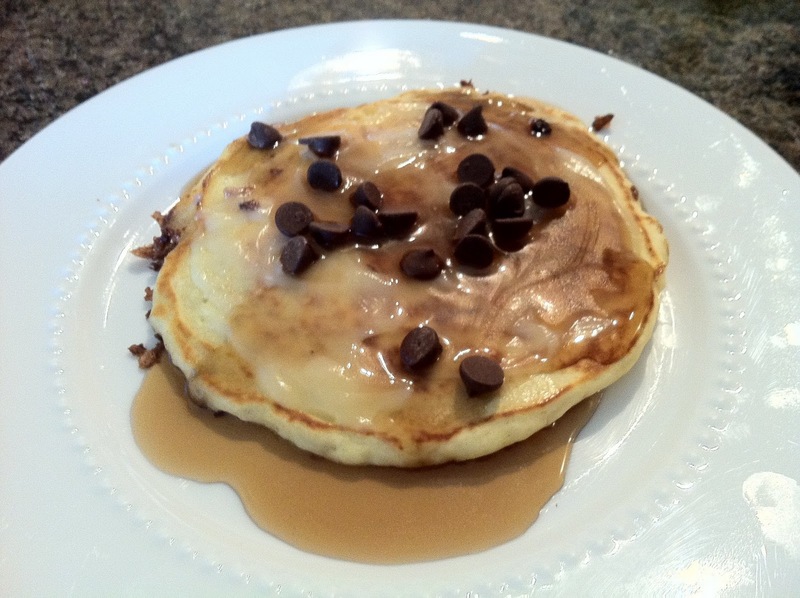 Chocolate chips are a nice addition too if you're feeling crazy. These were a huge hit with my kids! Delicious!